This was the one that got away. After leading Roswell High through three full quarters of play Tuesday at Bulldog Pit – by as many as 18 points in the second quarter and by eight going into the fourth – the Runnin’ ‘Dogs let nerves get the best of them in the final moments of play. The result was a 21-point showing for the Coyotes in the final eight minutes to Artesia’s eight, and a 50-45 win for the boys in red, snatched from the jaws of defeat. “I’m really proud of the way our guys went out and competed last night,” head coach Michael Mondragon said today. “They played extremely hard and never backed down. We did a lot of great things, but unfortunately, down the stretch right there, we just didn’t execute very well. Roswell High slashed their deficit to four, 37-33, within one minute of the start of the fourth and began to do something the ‘Dogs hadn’t allowed to that point – scoring in bunches. A drive to the hoop by Chaney Hardt was answered by four points from Roswell, as was a Bryce McAlister layup, and just like that, the Coyotes took their first lead of the night with four minutes remaining in the bout, 42-41. A hard charge into the lane by Caleb Dean briefly returned the edge to the ‘Dogs, but that would mark Artesia’s final true push inside. After Joe Willingham and Roswell’s Chris Mesquita traded buckets to make it 45-44 Bulldogs, the boys in orange stayed around the perimeter while Roswell’s Logan Eaker shoved his way into the paint to return the one-point edge to the Coyotes, 46-45, with 1:50 on the clock. A three-point try by Artesia bounced off the rim and ultimately resulted in a foul. Mesquita missed the front end of the one-and-one, keeping the ‘Dogs’ hopes alive. But an easy shot off the glass was missed, and Garret Smothermon made the task harder by converting both of his free-throw tries to make it 48-45. Artesia got two solid looks from beyond the arc in the ensuing seconds but missed both, and two from the stripe by Eaker sealed the deal, 50-45. The ‘Dogs had come out gangbusters defensively in the contest, effectively limiting the Coyotes to six points in the opening quarter with quick-handed guarding and excellent rebounding. Devon Torres got Artesia on the board a minute in with a drive to the hole, and following a three-point play by McAlister and two off the glass by Taylor Null, who had a strong night on the boards, the Bulldogs were up 11-6 going into the second. With McAlister nailing short-range jumpers and Willingham taking advantage of his size inside, the ‘Dogs were able to build on their lead, and a Torres trey and layup by Alan Cosio in the final minutes of the half gave Artesia a solid cushion at the break, 28-17. The boys in orange continued to keep the Coyotes’ scoring low in the third but unfortunately weren’t able to add much offense of their own. Four points from Null and two from Willingham comprised the ‘Dogs’ output from the field until the final second, when Hardt drained a trey to make it 37-29. “The biggest thing this game shows is that we can play with anybody in the state,” said Mondragon. “If we defend and rebound the way we did last night, we can beat anybody. We just have to get back to execution. A lot of those mistakes we were making were just guys in the wrong places at the wrong times, and they know better. Sometimes, you make mistakes, and we just did it at the wrong times. Willingham finished with 11 points for the Bulldogs on the night, followed by McAlister with 10 and Null with eight. Mesquita accounted for 27 of Roswell’s 50 points. The Bulldogs shot 35 percent overall from the field on the night to Roswell’s 46 and were seven of nine – with all of Artesia’s free-throw attempts coming in the first half – from the line to the Coyotes’ 15 of 20. The ‘Dogs (14-7, 1-1) will now prepare to square off with Goddard at 7 p.m. Friday for Pack the Pit night. 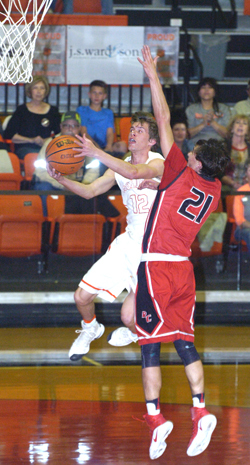 Artesia topped the Rockets 56-49 Dec. 29 in the semifinal round of the Poe Corn Invitational. “We have to stay focused,” said Mondragon. “Goddard’s sitting at 0-2, so they’re fighting for their lives trying to get into state. We just need to stay focused for four quarters, finish our opportunities, and make sure we’re executing on the press break and all the little things.